Although JCPenney has been jonesing to start selling Martha Stewart-designed products in its Martha mini-shops, for now it seems that desire will have to be curbed. The department store agreed yesterday to set aside its plans for Martha’s products in its stores at least until an April 8 court date. Rival Macy’s is probably thrilled, while Stewart is likely still wondering if everyone has two houses and thus, a need for two casserole dishes. Macy’s has been firm in its claim that it has the exclusive right to sell Martha Stewart products since its deal with her company in 2006, while JCPenney and Martha Stewart Living Omnimedia think there’s room for everyone to share. The lawsuit filed by Macy’s has been trundling along in a New York State Supreme Court, and yesterday the judge adjourned the trial until April because of attorney scheduling conflicts, reports Reuters. He told them to try talk thinks out during the break. 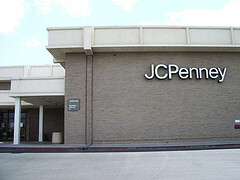 JCPenney is already suffering — yesterday it announced even more layoffs — so not being able to put those Martha Stewart products on the shelves would be a big blow to the company. “Macy’s, of course, will comply with the court’s orders,” said a spokesman for Macy’s. “We view today’s actions as a positive step forward,” MSLO said in a statement.